Dr. Sonnenblick completed her undergraduate education at Northwestern University where she was elected to Phi Beta Kappa and graduated with Honors and Distinction. She then attended Weill Cornell University Medical College where she earned her Doctor of Medicine degree and was awarded the Ralph I. Poucher Prize for Proficiency in Ob/Gyn. Upon graduation from medical school, she completed her residency training at George Washington University, one of the country's premier Ob/Gyn training programs. Dr Sonnenblick is Board Certified by the American Board of Obstetricians and Gynecologists and is a Fellow in the American College of Obstetricians and Gynecologists. 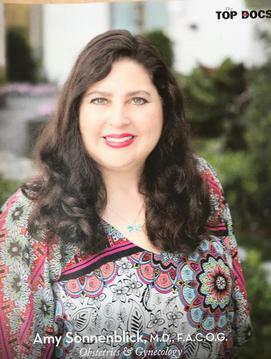 She is a member of the Florida Medical Association, Broward County Medical Association and Ft. Lauderdale Surgical Society. She has appeared as an Ob/Gyn consultant on many television news, talk shows and lectures. Dr Sonnenblick is dedicated to providing the highest level of compassion and care to her patients. She emphasizes a collaborative approach with her patients to help them develop an individualized strategy to treat and prevent disease. Her staff is professional and friendly and shares in her commitment to outstanding personalized patient care. Dr Amy Sonnenblick has been practicing Obstetrics and Gynecology in South Florida for more than 10 years. She has been a pioneer in the emerging specialty of office based Women's Healthcare. Her practice focuses on treating women throughout all stages of life offering both general and specialty gynecologic services. Dr. Sonnenblick has been recognized by Gold Coast Magazine as a Top Doctor in South Florida. Her expertise includes adolescent medicine, early detection of cancer, menopausal management, infertility, abnormal pap smears/HPV, contraception, sexual dysfunction, women's wellness and preventive care. 600 S Pine Island Rd.